Canine Myasthenia Gravis can rob your dog of her mobility and leave her susceptible to aspiration pneumonia. Learn about the signs of this disease and the kind of treatments available. You may have heard of Myasthenia Gravis in connection to humans, but the disease can also affect dogs with many of the same symptoms. Essentially, Canine Myasthenia Gravis (CMG) is a neuromuscular disease that affects communication between the nerves and muscles that operate your dog's legs, face, throat and more. In a normally functioning body, neurons receive messages from the brain and govern the movement of muscles. Neurons communicate between each other by emitting chemicals known as neurotransmitters. Once a message has been sent by one neuron and received by another, the chemical message, or neurotransmitter, is destroyed by the appropriate enzyme to prevent it from continuously communicating the original message. This allows the muscle to respond to the message to move as it was originally stimulated to do, without repeating the movement unless a fresh signal is received. There are actually three kinds of muscle tissue, but it is striated/voluntary muscle tissue that is affected by CMG. The area where a neuron makes a connection with muscle tissue is called the neuromuscular junction, and it's this junction that is damaged by the disease. There are basically two types of CMG, and they can affect the neuromuscular junction in different ways. Congenital CMG is the hereditary form of the disease in which a dog is born without the normal neuromuscular junctions to direct movement. There is no treatment for this form of the disease. Acquired CMG is actually an auto-immune disease that causes the immune system to misidentify the neuromuscular junctions as foreign bodies. It attacks them until they are effectively destroyed, knocking out communication. Regurgitation is one of the main indicators for CMG because the disease affects the dog's ability to swallow. CMG is directly linked to a condition known as megaesophagus, in which the esophagus loses the ability to transport food to the stomach. The tissue actually becomes enlarged and loses its tone.This can be quite dangerous because as the tissue enlarges, the reflex that protects the lungs is also affected, and this can allow food particles to enter the airways. Foreign matter in the lungs can lead to aspiration pneumonia, a condition that can cause death if the infection isn't treated in time. There is such a strong link between CMG and megaesophagus that where there is one condition, you'll most likely find the other. This is why vets routinely check for both conditions at the same time when pursuing a diagnosis. Diagnosis is made through observation of the clinical signs and a blood test that reveals the level of CMG antibodies present in the bloodstream. While there is no treatment for congenital CMG, the auto-immune form of the disease can be controlled with medications. Removal of the thymus gland may also be an option, but so far this procedure has not proven as effective for canines as it has for humans. It's interesting to note that there is a high remission rate for CMG. Nearly 90 percent of affected dogs experience remission within 18 months of the disease's onset, even if they do not receive treatment. However, remission is not a guarantee the disease is finished. 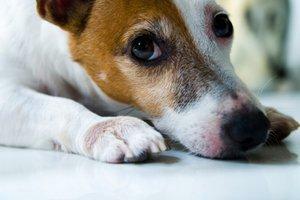 Antibody testing should be carried out over the rest of an affected dog's life, and treatment resumed as needed. To date, Myasthenia Gravis has mainly been detected in Springer Spaniels, Smooth Fox Terriers, Miniature Dachshunds and Jack Russell Terriers. However, the disease is not limited to these breeds, and any dog suffering from regurgitation attributed to megaesophagus should also be tested for CMG.